Drain the cherries, reserving the juice. Let dab the cherries gently with a paper towel so that they are as dry as possible. Set them aside on paper towels to continue to dry while you prepare the sugar dough. In a medium size bowl mix butter,cup of powdered sugar, corn syrup, 1 tablespoon of liquid from cherries and invertase. Stir until blended. Add 1/2 cup of powdered sugar, until the mixture forms a soft dough. Refrigerate the dough for 30 minutes.Roll the sugar dough in 1/2-inch balls. 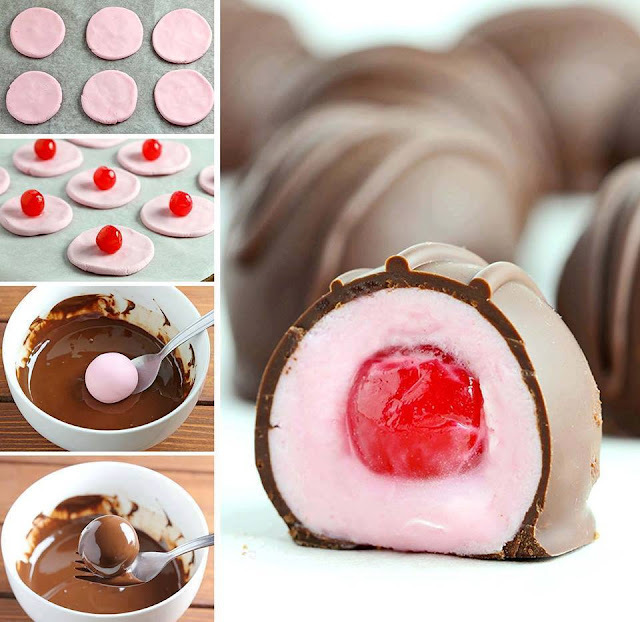 Flatten the balls and use the flattened dough to completely cover the cherry. Refrigerate the dough covered cherries for 20 minutes. Meanwhile melt the chocolate according to the directions on the back of the package. I use the microwave. Dip balls in chocolate with a fork, shaking off excess and return to prepared sheet. Refrigerate the covered cherries for 20 minutes. Carefully drizzle chocolate over truffles. Store in the refrigerator and serve cold.